Provides statistical information on academic programs, admission requirements, enrollment and graduate levels, tuition costs, faculty, curriculum, educational expenses and institutional finances. Also features trends in applications, first-year and total predoctoral enrollments, first-year repeaters, attrition rates, numbers of graduates, female student enrollment and first-year tuition and fees. Particularly useful for counselors. 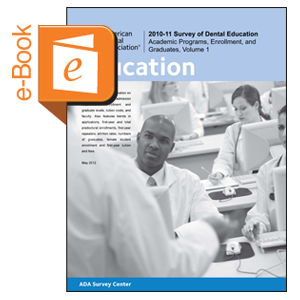 A downloadable version of this report is available free of charge at www.ada.org/edreports.